The Library inside Biltmore House - see many more photos from 2018! Plan ahead and book dates and times for both daytime and candlelight tours, since prime dates and times sell-out in advance. 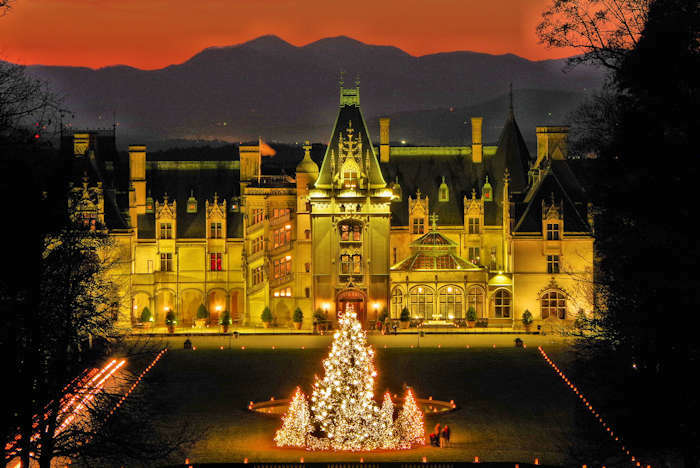 All tickets include self-guided tours of Biltmore House, the gardens, Antler Hill Village with more lights, and the Winery (open until 9 PM) for a complimentary wine tasting. 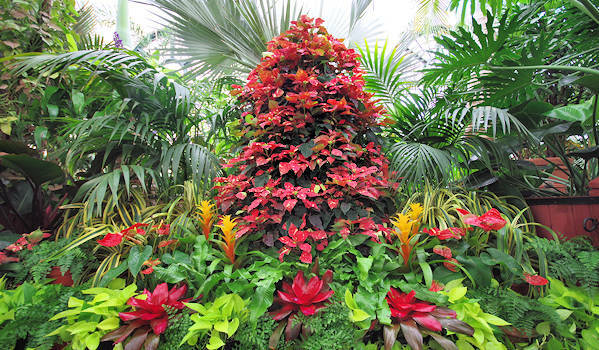 Don't miss a trip to the tropics inside the Conservatory and strolling through the gardens with winter plantings. 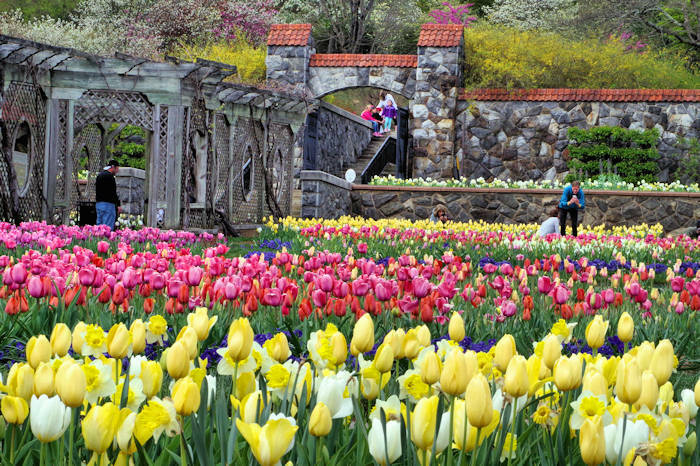 See our main Biltmore Insider's Guide for more ideas of things to do. Daytime Tickets include a self-guided house tour before 5 PM with a full day of estate exploration. On many days, you must book an entry time into the house to help with traffic flow. Save $10 when you buy online at least 7 days in advance. 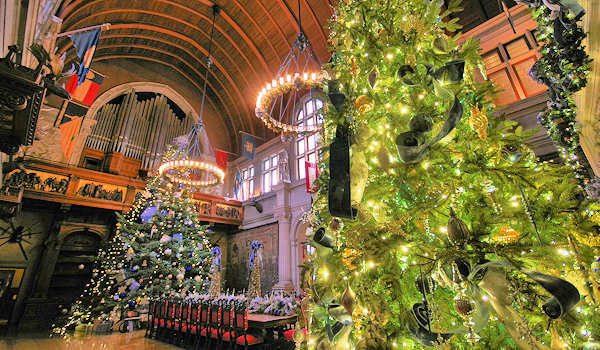 Candlelight Christmas Evening Tickets include a magical tour of Biltmore House (enter 5:45-10:45 PM), complete with choirs and live musicians. The front lawn glows with a 55-ft. Norway spruce with 45,000 lights and hundreds of luminaries. Advance purchase required, prime time slots fill up well in advance. Included with the Candlelight ticket is a daytime visit on the same day or next day to explore the rest of the Estate. Buy daytime tickets at least 7 days in advance on the Biltmore Estate website and save $10 or more per ticket. Tour time reservations for house entry are required for many days, so plan ahead! Many days will sell-out in advance. Seniors save $10 on Tuesday & Wednesday at Ticket Center. Military save $10 at Ticket Center. See overnight Biltmore Vacation Packages offered by area B&Bs, hotels and cabins that include discounted tickets. Tickets purchased at local hotels and B&Bs usually include a second day for free. Don't miss strolling through the gorgeous blooms and a huge array of plants inside the Conservatory by the Walled Garden. Also, walk through the winter gardens and along miles of peaceful trails. Biltmore’s floral arranging and gardening experts conduct free, daily seminars at A Gardener’s Place retail gift shop under the Conservatory at 1:30 PM. Read more about the Biltmore Gardens. Browse a dozen shops on the Estate including A Christmas Past, Bookbinder's, Toymaker's and Confectionery in the Stables beside the house. Don't miss the Wine Shop at the Winery. The Gate House Shop at the entrance of the Estate carries a sampling from many of the other shops - and you don't need a ticket to visit. 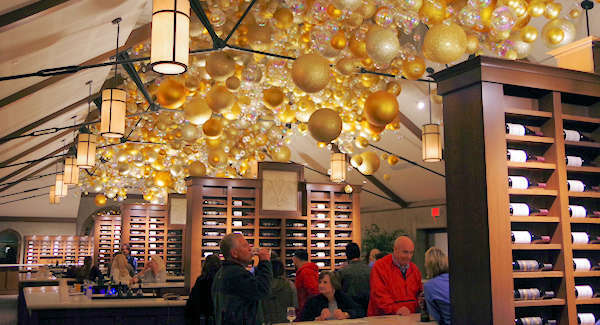 Don't miss sampling many Biltmore wines with very friendly experts (included with your admission) at the impressive Winery at Antler Hill Village. They are open until 9 PM! See why it's one of the most visited wineries in the country! In addition to the tasting, browsing the Wine Shop, and learning about winemaking, take one of their guided experiences. During the holiday season, they have their own Candlelight Tour. We love the Red Wine & Chocolate tasting. Read more about the Winery. Allow time during your visit on the estate to explore Antler Hill Village for many more lights, Winery tasting, Cedric's Tavern, shopping and more exhibits including the historic barn. Read more. Holiday hospitality extends throughout the entire Estate. Enjoy a festive meal at Bistro, Deerpark Restaurant, Stable Café, Cedric’s Tavern or The Dining Room at the Inn on Biltmore Estate. Go to the Biltmore Web site to read more about their restaurants. Both the Inn & Village Hotel offer several packages, including New Year’s Eve. The Inn will offer its annual Gingerbread House Tea. Biltmore has a big variety of retail shops, all perfect for holiday gift shopping. Other activities include taking a cozy horse and carriage ride (blankets provided) and exploring acres of landscaped gardens. 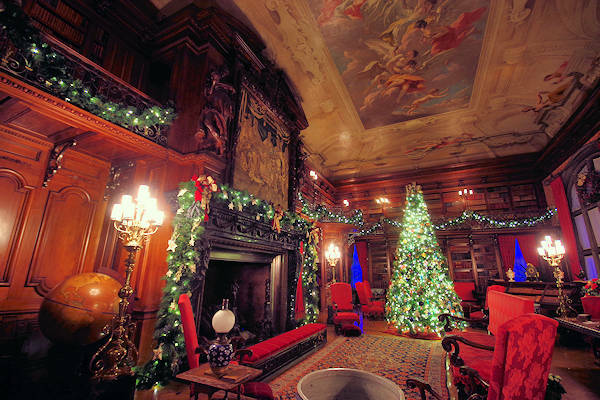 The Estate is open every day, including Thanksgiving, Christmas (9 AM-2 PM) and New Year’s Days. The house is open 9 AM-5 PM for daytime tours. Estate gate and ticketing office open at 8:30 AM. Candlelight tours start time are 5:30-10:45 PM, depending on the day and availabilty. Winery is open until 9 PM. Banquet Hall in grand style. See more Christmas photos inside the House. November 6, 2019: Watch the fun as 40 Biltmore workers maneuver the 35-ft. Fraser fir inside Biltmore’s Banquet Hall after Santa delivers it to the front door at 10 AM (see photos and video of tree's arrival). 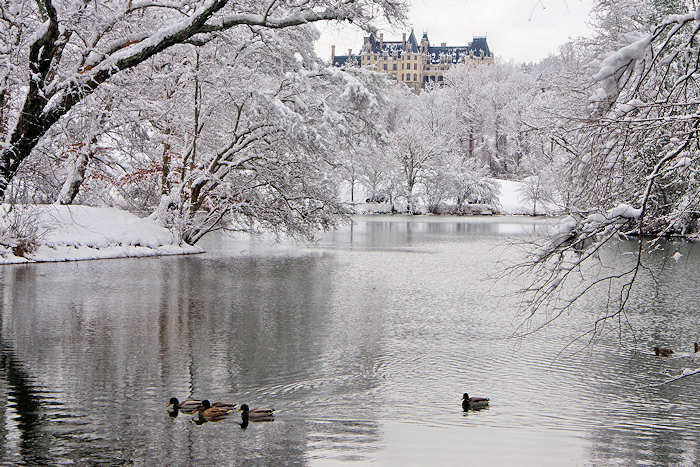 See our Biltmore Estate Guide for more things to do, including guided tours. Buy tickets well in advance. Many days will sell-out - especially Thanksgiving weekend, Saturdays and Christmas week. Busy days require a house tour reservation time. Yes, you can take photos inside the house. Biltmore phone number for general info and tickets is 1-800-411-3812. You may be amazed by the size of the Estate and all the things to see and do. Arrive early and allow a full day - or two! Reduced-price admission is available to guests with disabilities. Parking assistance is available. They have some wheelchairs inside the house for guests at no charge for touring of the first and second floors. Guests with hearing difficulties can request a Neckloop Telecoil Coupler, a printed transcript or sign language interpreter. Call them for your specific needs 1-800-411-3812. Wear comfortable walking shoes and layers to allow for changeable mountain weather. Bring a car. Parking is free and some of the Estate venues are several miles apart. Shuttles from the parking lot to Biltmore House are provided, but you'll need your own transportation to the other Estate attractions. If you stay overnight on the Estate, shuttles are provided free to all major stops. Remember, Candlelight Christmas Evenings require a separate ticket from daytime admission. Candlelight Christmas Evenings tickets are non-refundable, but you can change your date for a $20 fee. Or keep the ticket for a daytime visit later. 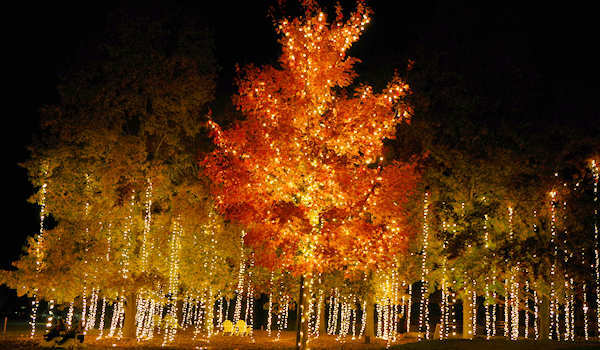 Candlelight Tickets include a daytime visit to the gardens and other areas of the estate. You can arrive as early as 8:30 AM and stay for your evening tour. If you arrive after 4:30 PM, you can return the next day. See our packages page for special offers & Biltmore packages from hotels, cabin rentals and bed and breakfast inns! While you in the area, see other House Museums for Holiday Tours. Daytime admission rates are $67-$75/adult. Highest ticket prices are Saturdays, Thanksgiving weekend and Christmas week. 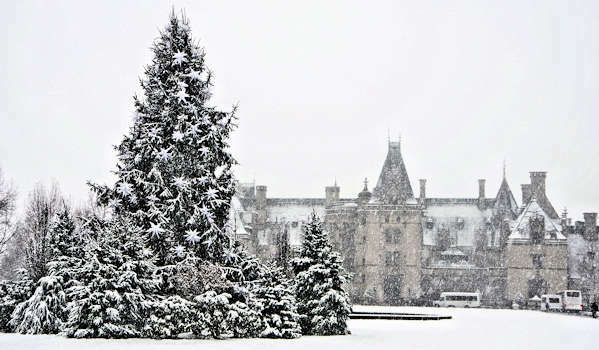 Buy online on the Biltmore Estate website at least 7 days in advance and get $10/person discount on daytime tickets. Children 9 and younger are admitted free year-round with a paying adult. Youth ages 10-16 are 50% off the adult price. Candlelight Tours $70-$90/person. Lower rates November and midweek. Highest Christmas week and weekends. No candlelight on Dec 24 or 25. Important: Many peak days will sell-out ahead of time, so plan ahead! 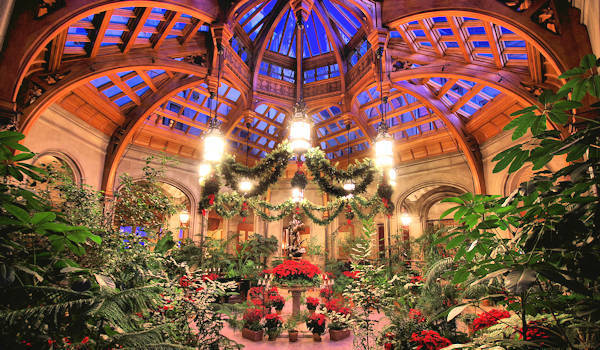 For more holiday fun in Asheville, see our Top Asheville Holiday Outings. If you are lucky, a little snow will add to the Christmas magic.